In the famous words of Bartok the Magnificent, "Wow! I tell you what, wow!" The synopsis of this book made it pretty clear what the book would be about, but there was still no way I could have known what I was in for. I usually hate contemporary fiction, but I think there's a pretty reasonable explanation for why I enjoyed this one. Here's a little-known fact: I have a degree in religious studies. I'm fascinated by different religions and even more so by cults and this is one of the best cult fiction pieces I've read. 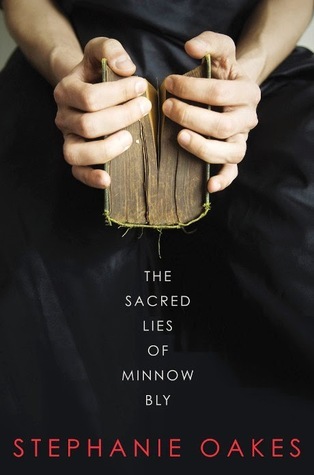 Suffice it to say The Sacred Lies of Minnow Bly totally and completely blew me away! Obviously, Minnow Bly is the center of this incredible story. Minnow has been a part of the Kevinians, a cult that lives in the middle of the woods, for the last twelve years of her life, from the age of five until seventeen, when she finally manages to escape. Amazingly, she is the only person who wanted to escape the cult, the rest of the characters following their leader blindly. This makes Minnow an incredibly strong character, in my opinion. Well, this and many other things. Minnow is written in such a way that I felt like I could really identify with her. I felt almost like I was inside her head with her, which isn't something I've been able to say about many fictional characters. Her head was a really confusing and oftentimes frightening place. Having been raised in a cult, Minnow knows very little about the real world and, most worrisome to her, she knows next to nothing about science. She has been taught that the sky is a canvas, the stars are God's eyes, and meteors are missiles. Throughout this book, Minnow strives to learn more about the natural world and make sense of all the nonsense she's been fed for her entire life. But she isn't happy taking anyone at their word. Instead Minnow makes it her mission to learn to read in order to learn - to find answers. I loved this about her! Possibly my favorite character in this book is Angel, Minnow's murderer cell mate in juvie, who just happens to be a huge science buff and takes it upon herself to help Minnow learn. While she does share her opinions on the world quite often, I liked that even more often she offered resources to help Minnow find answers for herself. This is how everyone should find answers, I think, rather than accepting anything on the word of anyone else. The love interest (there's no triangle, thank goodness) in The Sacred Lies of Minnow Bly is Jude, a boy who has also been raised in the woods, but not as part of a cult. The book stretches many years and tells their story in bits and pieces, allowing the reader to watch their relationship grow from childhood friendship to something more as time passes. My feelings towards Jude changed over the course of the book, but I felt like he was an overall positive character and a very believable love interest, which is not often the case in YA fiction. I could say so much more about the many other characters that made up this book, but I could honestly go on for pages! The Prophet is completely despicable, Minnow's family made me want to pull my hair out, and Dr. Wilson is incredibly complex. In case you haven't picked up on it, the characters in this book are amazingly well-written. There are really two settings in this book - The Community and the jail that Minnow is sentenced to. The jail could really be any other jail. It was well-written but how much can you really say about jail that hasn't been said somewhere else? But The Community was just... it was like I was there. I'm really not sure how Stephanie Oakes did it, but she made me feel like I was watching through a TV screen. I can picture the entire Community almost in detail. I can see the buildings and the surrounding woods and the pond and the animals. There was a contradictory air of serene trepidation surrounding the Community that I could almost feel when I was reading about it. Minnow's unease and need to get away was so real based on the way all of her surroundings were described! My point is the world building was also completely amazing. Have you guessed yet what I'm going to say about this story? Um... yes, it was amazing. I'm sorry I don't have better words to describe it. I'm going to be honest here: I have an anxiety problem. The entire time I was reading this (and even in between the times I was actually reading) I had a constant feeling of unease. That's how good Stephanie Oakes is at setting the tone. This book made me feel for Minnow Bly even when I wasn't reading it! This book paints such an amazing picture of a cult that is so terrible it should be unbelievable, but really isn't. From the beginning I was thinking that nothing like this could ever happen. Then I thought about Jonestown and even the story of Irene Spencer and I knew that it absolutely could, which makes it even more horrendous. One of my favorite parts of this book (one of my favorite parts...) was that I really didn't know what happened! It was kind of a whodunit throughout and it wasn't until the very end that the truth about who killed the Prophet came to light. The only thing I didn't absolutely love was the ending. I wish there had been more of a resolution to the story. Instead, it just kind of ended a little vaguely. It would be really awesome if Stephanie Oakes would release a novella so that I could find out what actually happened to Minnow! I've already said way too much about this book. I could probably go on for a lot longer about everything I loved, but I won't. I really think everyone should read this book! I don't usually include quotes in my reviews, but this was so beautifully written (the author has a degree in poetry) that I can't end this review without leaving you with at least a couple. Jude taught me what love was: to be willing to hold on to another person's pain. That's it. I nod. "You know one thing the Prophet never answered? That nobody ever wondered about but me? People. What made us. Where we came from." "But you know that already," Angel says. "From the stars."